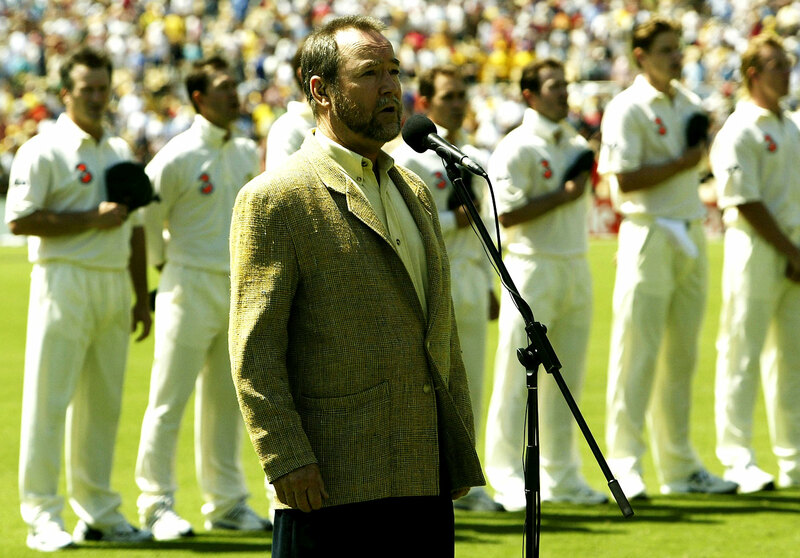 When Sir Donald Bradman left us for the cricket ground in the sky in 2001, I was absolutely humbled to be asked at his memorial service… My time for the song arrived. The television crew directed me to the side door of the cathedral… The security person at the door said g'day and told me that my fly was open! My first reaction was, 'Good one, mate, ha ha', but I checked…. and sure enough, my fly was open! Singer-songwriter John Williamson, as is apparent from the above account in his autobiography Hey True Blue, delights in the Australian colloquial. The musician is wonderfully unfashionable: his voice employs a penetrating Australian accent, his rhyme celebrates a distinct brand of his nation, and his musical settings are often adorned with emotional arrangements of children's choirs and synthesizers. I was in awe of Sir Don and his average of 99 runs… But details can be boring in a song. I thought it should be mainly about how proud Aussies are of his unbelievable record. The Bradmans liked "Sir Don" and it was at the family's invitation that Williamson performed the work at the public memorial service. Its hero worship with nationalist overtones is at odds with their own pragmatic approach, though. "Sir Don" makes a strange, shrill bedfellow given the emphasis with which Bradman's son, John, concluded his eulogy: "I invite you to celebrate the life of my dad but please celebrate what he stood for. This means you must let him go free: don't enslave him with worship. He had wonderful qualities but he was a fellow human being with foibles and contradictions like the rest of us." 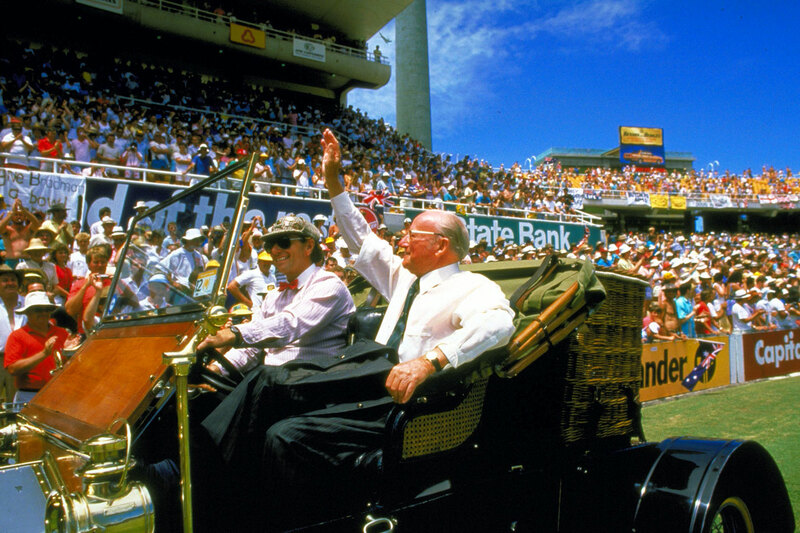 Notwithstanding, "Sir Don" exemplifies the manner in which Bradman has come to be celebrated in Australia. This takes different forms, from a plethora of biographical tomes to more unexpected devotionals, including, as Williamson has undertaken, pieces of music. There are at least 20 musical works related to Bradman, a goodish many of which are forgettable. However, unlistenable does not imply uninteresting. An assortment of pop songs, a country song with a jug band, an earnest folk ballad, a radiophonic piece, an art song and a large orchestral work: this music demonstrates, among other things, the appropriation of Bradman's image in Australia. It's a window, and a fun one, into a more general trend taken by books, television, biscuits, civic amenities and politics over the past 35 years. Bradman has been reinvented from a sportsman to a figure of nationalism, with cricket fairly incidental to proceedings. 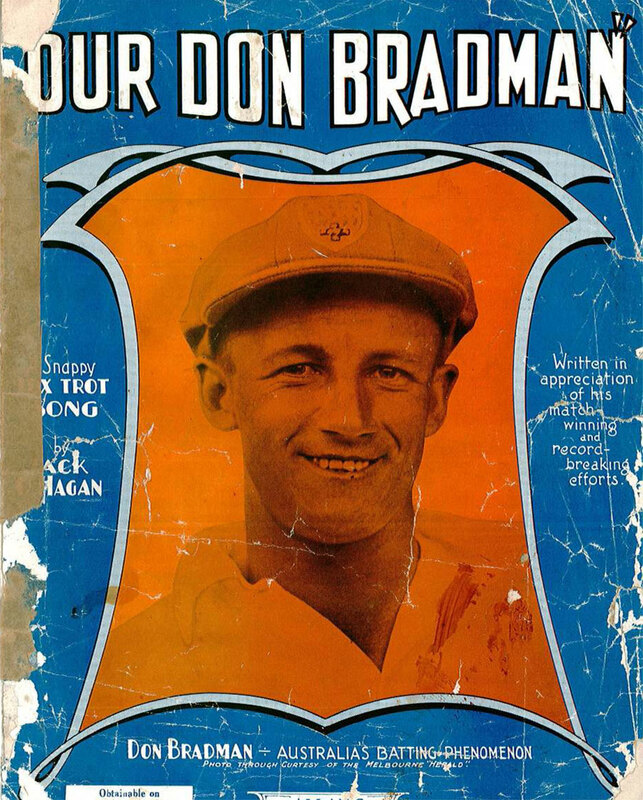 Williamson didn't ruffle the charts, but Bradman has inspired one hit song: Jack O'Hagan's "Our Don Bradman", which, in 1930, the year of Bradman's breakthrough Ashes series, established the canon of music devoted to the cricketer. It's a marvellous tune: an appealing melody that is easy to sing or whistle, coloured by a cracking dance band accompaniment. Whenever I have mentioned the topic of Bradman songs to an Australian of an older generation, this is the work they hum. Sometimes the younger ones do too. The 21-year-old Bradman made a mountain of runs that English summer and brought off an unlikely Ashes victory. "Our Don Bradman" is not a spontaneous work of devotion, though, for Bradman was ripe for commercial exploitation. Not the last to realise it, Bradman made public appearances at theatres, cinemas and civic gatherings, to be presented with cheques and gifts. He attempted forays into fashion, journalism, broadcasting, and even went in for songwriting and making records himself. It is unsurprising then that he should have been seized upon as a lucrative subject by musicians. That year's Ashes was the first northern series to be broadcast on radio in Australia. A vaudeville troupe was employed to fill the gaps between the telegraphed updates, with O'Hagan singing at the piano. 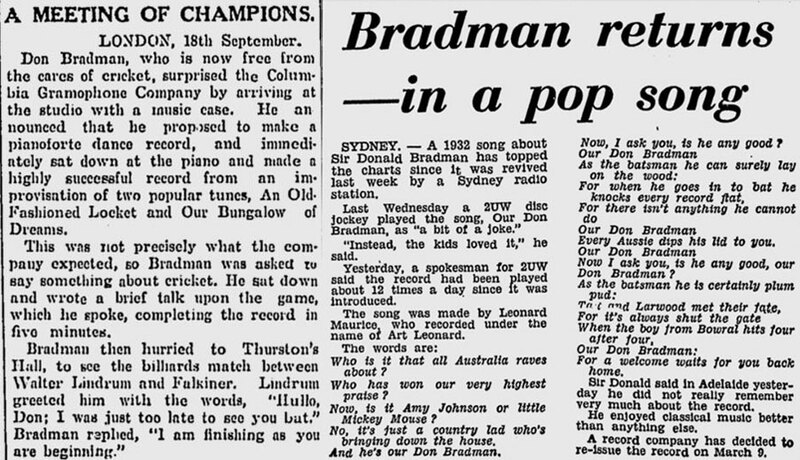 "Our Don Bradman" was given its radio premiere just in time for Bradman's 300 on the first day in Leeds. It immediately took off, selling 40,000 copies in sheet music within the week. "An event occurred, so we wrote a song about it… If we knew what the public wanted we would certainly give it to them. There is no yard stick for judging whether a song will catch on. One song may have little intrinsic merit and sell by the million, while another is forgotten. O'Hagan spawned imitators, songwriters eager to capitalise upon the swell of interest in Bradman, and that year there was a slew of songs - varying in quality - that remain unpublished, unrecorded and, resultantly, obscure. Then there was silence. It was 57 years until a new song dedicated to Bradman appeared. Understanding this silence involves dipping into the rather wonderful drama that was Bradman's career, for, as it progressed, it became like that of all bright young things: complicated. Bradman suffered ill health: a seriously run-down condition that kept him out of the first Ashes Test of 1932, an infected appendix and subsequent peritonitis that nearly killed him in 1934, chronic muscular problems that totally incapacitated him during the years of the Second World War and nearly curtailed his career afterward, not to mention acute sea-sickness during voyages for the northern Ashes. There was also a conscious move by Bradman, away from the public traipsing that marked his youthful commercial ventures, into respectability and privacy. Bradman secured employment in a stockbroking firm, moved from the comparative bustle of Sydney to the quiet anonymity of Adelaide, and engaged in family life and a business career that saw him establish his own stockbroking firm and eventually embark on corporate directorship. When academic Brett Hutchins published a text last decade delineating the Bradman Australiana myth, it was scathed in the Daily Mail as a "hatchet job worthy of a hotshot tabloid assassin"
Immediately after his retirement… [Bradman] was not the universally praised hero to whom we have become accustomed. In fact, by the early 1950s Bradman was the most controversial and divisive figure in the cricket world. It is not going too far to say that he was engaged in a bitter fight to redeem his reputation. What part any of these factors had upon songwriters is not lavishly apparent, but desist from efforts they certainly did. After a passing mention in a 1934 adaptation of an American football song "You've Got to Be a Cricket Hero (to Get Along With the Beautiful Girls)" ("If the girls are what you want to get, man/You must be a Brown or a Don Bradman") he was forsaken by musical tribute for the remainder of his playing career. Indeed, after Bradman retired from playing (with a knighthood) he was avoided not merely by songwriters but by book writers too. Breaking the silence, in 1978, Irving Rosenwater published Sir Donald Bradman. Rosenwater was a BBC television scorer who had left his employers to join World Series Cricket and Kerry Packer's Channel Nine television network. He sat to work in his study each day, wearing a tie although no one was there to see it, and compiled the cream of the Bradman biographies. Sir Donald Bradman relates the particulars of the cricketer's career, pays heed to the controversies involved and is a celebration of its subject as both man and sportsman. There then began in the 1980s an outpouring of public admiration: a cavalcade of books and publications; Bradman stands and private rooms at the state grounds with Bradman statues in their parklands; Bodyline, the television series (Bradman hopelessly miscast as of burly build and broad Australian accent, with scant resemblance to the cricketer's own courteous manner, small build and high-pitched voice); Bradman on biscuit tins and diverse knick-knacks; Bradman commemorated with postage stamps, a series of 20-cent coins, a Companion of the Order of Australia, and Adelaide's Sir Donald Bradman Drive, a major arterial road that runs through the city. Such was the torrential frenzy for Bradman that the cricketer trademarked his name in 1992, taking umbrage after finding it used without permission on a beer bottle. It's not clear why Bradman was subject to such popular acclaim at that time. He seems to have done little to court it himself and Rosenwater's biography wasn't the type to inspire rabid worship. One possibility is that cricket was at a peak of popularity in Australia following World Series Cricket, and with a weak national team being beaten up every other summer by West Indies, the glory of Bradman was something to cling to. It's also evident that Bradman was selected as a totem for a movement of Australian nationalism that had been fuelled by Labor governments of the 1970s and 1980s. "…a unique Australian - a man representing many of the values, much of the character of his countrymen. Even now, in a world scarcely recognisable to that in which he played, the name Bradman resonates with meaning - talent, determination, commitment, fair play, honour. The queer spike in Bradman devotion, and the energy expended in its cause, is well demonstrated in his biographies. There is a deal of dross. One biography, Bradman: an Australian Hero, is by a British Baron and Oxford Blue, Charles Williams, and begins with the tale of the Flying Pieman, a 19th-century Sydney athlete. Bedecked with ribbons and streamers, the Pieman would undertake ludicrous exploits - such as racing horse-drawn mail carriages for hundreds of miles while weighed down with carriage poles or a top hat or a goat ,for handicap - and always, against wager, win. Such was the Pieman's success that eventually no one would bet against him. He died, homeless and destitute, in an asylum. It's the only part of Charles Williams' book that needed to be written, which is more than can be said for some of the literature devoted to Bradman. Michael Page's Bradman: The Illustrated Biography revoices all of the opinions from Bradman's own three autobiographies with the added grace of images. There is miscellany, such as Christine Wallace's The Private Don, which summarises Bradman's correspondence with an Adelaide newspaper editor. It details little revelatory other than voicing some of his feelings on his son that the public had little need to know. Most heinous is Roland Perry's The Don, which, built like a phonebook, is given to inventing Bradman's thoughts at any particular moment, and contributes little to understanding the cricketer other than a description of his preferences in taking tea (milky, sugary). And it almost got me into a fight down some dingy pub in one of Melbourne's rougher suburbs when I voiced these opinions. 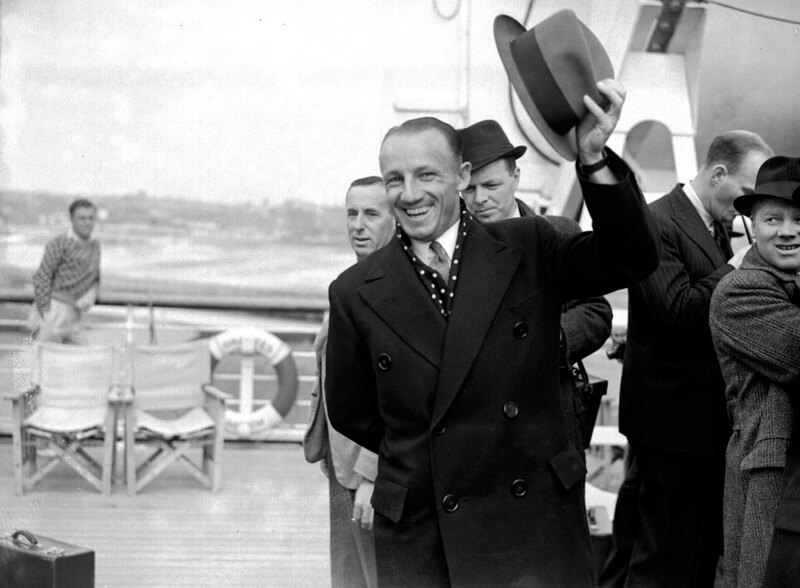 From Perry's assertion that "Bradman did a great deal, arguably more than any other individual Australian in the twentieth century, to define a character that was distinctly, culturally Australian" to Charles Williams writing in Bradman: an Australian Hero that "Australia turned to spectator sport as the prime vehicle for the aspirations to national identity… Cricketing heroes were its Davids and the British Empire its Goliath", hagiography and nationalism were set in. Released in 1987, Paul Kelly and the Coloured Girls' "Bradman" was the first original musical tribute to the cricketer since 1930. It's an epic, with a running length of seven minutes and 28 seconds, and the most musically appealing of the songs devoted to Bradman: upbeat, and coloured with ringing guitar lines and an arpeggiating piano. Don Bradman came along at a time when Australia was hungry for heroes, clawing its way out of the Depression and defining itself against the Mother Country. The Don stood for Australian prowess, independence and freedom of spirit. He was the Boy From The Bush, a self-taught loner-genius, the diminutive David who strode out of the wilderness slinging his stick against the imperial Goliath. Kelly's "Bradman" set the tone for the musical works that followed, from Williamson's "Sir Don" to more obscure tributes, such as Tony Tkalec's "99.94 Ain't So Bad". O'Hagan's "Our Don Bradman" was recorded by various Australian artists, including Maurie Fields, Jim Haynes and Greg Champion, while the Australian Broadcasting Commission released the two-CD set Don Bradman: The Music He Loved, a set of popular songs and classical works appreciated by Bradman. Composers followed suit and the twin brothers Martin and Peter Wesley-Smith featured an elegiac song, "The Don", as part of their 2001 grand oratorio, Black Ribbon. Colin Black's The Ears Outside My Listening Room is focused on the composer's grandfather describing Bradman on the radio in the 1930s. A string quartet doubles the melody from the speech patterns as well as interlaced commentary of Bradman bringing up a century off Hammond's bowling. …reflects on Bradman's place in Australian sporting history and national folklore, his contribution to the game as a player and a leader, and the values and beliefs that shaped his life. A headline from a review in the Australian newspaper, "Fine tribute to the Don spoiled by a heavy serve of patriotism" gives an idea of the piece's tone. Commissioned by the State Government of South Australia and premiered by the Adelaide Symphony Orchestra in 2014, Our Don is the ultimate expression of mythologising Bradman in Australian music. It's a government-sponsored work performed by a state orchestra that celebrates Bradman's sporting deeds not for their own sake but as actions by a figure of Australian importance, a process in which the cricketer's personal values and character are drawn upon. If there has been any general slackening of tribute to Bradman following his death in 2001, Natalie Williams' symphony suggests otherwise, maintaining the tone of reverence on a grand scale. There's a few oddballs, too, such as that of Kamahl, an Australian crooner of low, rich voice, whose "I Was a Mate of Don Bradman's" is not a devotional to Bradman's triumphs but an ebullient description of their friendship. In 1955, with the first three balls of the summer, the young Kamahl took a hat-trick for Kensington, Bradman's Adelaide club, and was congratulated that evening by Sir Donald. Later in his career, the singer enjoyed a close relationship with the Bradmans, leading to this tribute, which, like much of Kamahl's work, is both fascinating and bizarre. Another is by Ted Egan, whose career began with "We've Got Some Bloody Good Drinkers in the Northern Territory", a nearly eight-minute paean celebrating imbibers in Australia's vast northern outback province. Egan's "The Tiger and the Don" is the only song of recent times to celebrate Bradman purely as a cricketer, not as a trumped-up image of nation. While there is an element of facetious exaggeration here, particularly in its mockery of Bradman's final innings for a duck, "The Eulogy Song" is the only musical work to suggest that there are negative values associated with Bradman. More remarkable than Hansen's lyric is the vehement reaction it attracted, most prominently by Australian politicians, with both the then prime minister and opposition leader describing it, respectively, as "contemptible" and "disgusting". Criticising Bradman is ever a dicey business. Censure from fellow cricketers has tended to be dismissed, not always quite accurately, as jealousy. When academic Brett Hutchins published a text last decade delineating the Bradman Australiana myth - speaking chiefly of the myth and little of Bradman - it was scathed in the Daily Mail as a "hatchet job worthy of a hotshot tabloid assassin". It's possibly safer now, than ever before, to criticise Bradman though the angry reactions often drown out the essence of the criticism. But while his status as an Australian symbol is waning as the country redefines itself, Natalie Williams' symphonic tribute shows that the cricketer is still a potent figure of nationhood. There is a sense of public ownership over Bradman. "We all miss him, don't we?" a young librarian at my local asked at the loans desk. I didn't mean to be rude when I answered, "Oh, I didn't know him." The librarian's face was crushed. Public ownership is odd. A similar thing occurred when Phillip Hughes died. It wasn't sinister, but as people felt sad and confused and moved to articulate this feeling, they generally did so expressing a familiarity created there and then. It was difficult to understand who they were mourning. It's not a hideous crime to trump up Bradman as an Australian hero, the embodiment of a national ideal. He's not being used to endorse National Socialism; just, at worst, a bit of chest-beating. That musicians have contributed to the canon enlivens the tributes. Gives it a bit of zip. They don't necessarily tell us who Bradman was, though. That cricket or cricketers can be used for such purposes gives an idea of the sport's power. It doesn't take reading Mike Marqusee or those dense political stories that come up on ESPNcricinfo to know that cricket bends into other realms of society. Sachin Tendulkar may well become caught up in a bit of myth-making (not that it hasn't occurred already) and goodness knows what other cricketers may be seized upon. Interrogating myths can prove useful. They may go bad.